We love making apps! Most of all we love making apps that teachers love. We want to save you time and effort in your busy day... but Little Monkey Apps never want to replace tried and true pedagogy. 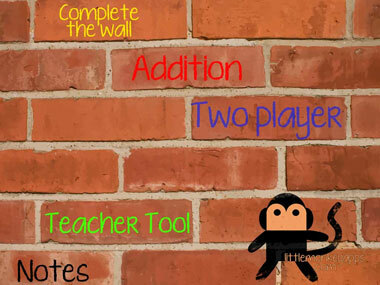 Little Monkey Apps Fraction Wall is designed to complement traditional hands on approaches and can be used in a small group, teacher directed, for independent learning and includes a partner games. The app can be used to enhance use of using paper (or laminated) poster style fraction walls or Cuisenaire rods as well as a visual aid to answer traditional pen and paper style questions. Little Monkey Apps know that in your classrooms, you want to teach the same content in a variety of ways so that all students have a chance to 'get it' and apply their knowledge in a variety of formats. We want you to use hands on activities and manipulatives and embed learning in real physical experiences. You might have to visit the library or check your classroom cupboards to find the equipment you need but please don't our apps as the ONLY way of teaching! You wouldn't expect your students to learn in a completely virtual environment....growing plants by using a virtual garden, or chemical reactions using a virtual science lab...you go to the effort of resourcing appropriate equipment, including technology and apps you have that suit your purposes. So don't only teach fractions using a virtual (albeit a very well made) fraction wall! We are not saying don't buy our app... What we are saying is make a fraction wall using paper strips, use cuisinaire rods to show equivalent fractions (until you are tired of picking up rods), use every way you can think of to demonstrate and use a fraction wall... including Little Monkey Apps fraction wall! As with our other Apps, we have 'modules' or sections. Feel free to use them any way you want, but here is how we would use them in our classrooms. The teacher module is designed for use with a teacher, tutor or partner or for independent use to answer equivalent fraction problems. Use in a small teaching group situation. There are no right or wrong answers here only teachable moments and discoveries! Utilise the slide ruler across the bottom. 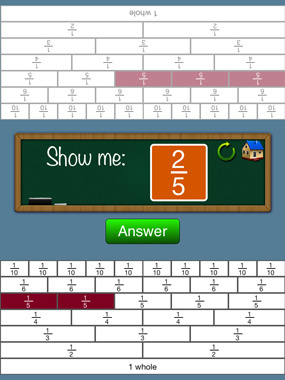 When a ruler is positioned carefully, the app will display the equivalent fractions across the top of the wall. We say careful because 6/7ths is almost the same as 13/15ths... but its not! What a great classroom discussion could ensue! 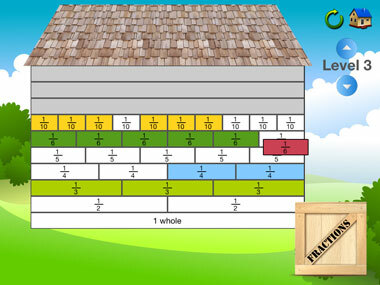 Students can click on each 'brick' of the fraction wall to shade bricks, allowing the wall to be used for recognising and naming fractions (who can make four fifths?) For addition and subtractions of fractions, or to demonstrate equivalent bricks. This task is basically a jigsaw puzzle. We have used this with laminated fraction walls where the student physically places the pieces on the wall... but they slip and slide and you ALWAYS lose the pieces. The student is presented with an unshaded (blank) fraction wall with divisions marked. The forklift delivers the fraction pieces in a box. Click on the box to get a fraction 'piece' or brick to build the wall. Students place the brick in the corresponding position. Students can place an equivalent fraction for example one quarter can take the place of two eighth bricks. Turning the fraction wall into a game is something easily done by printing off a couple of copies of an unshaded fraction wall and labelling a die with the correct fractions... or having two die, one for the numerator, one for the denominator but guess what, we've put it in an App! No die to locate or not enough printed...laminate and not have enough whiteboard markers! The aim of this game is to fill your wall before your partner. The "show me" bar flips face the 'current' player. The player then taps the bricks to match, then presses 'Answer.' 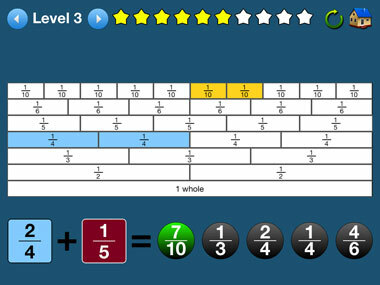 Students can place the pieces on equivalent fractions. If a player answers incorrectly, then the bricks just placed disappear and it is the other player's turn. No cheating or devious brick placing can occur! During our testing phase, we showed this section to some "older" members of the Little Monkey Apps family. Some of them couldn't do Level 4 because they could not use a visual method of equivalent fractions, their response was "I need a piece of paper to change the denominator" and "whatever you do to the bottom, you do to the top." All valid methods, but the problem was 5/10 plus 1/6th. You don't need to go to 30ths. The way we would solve it is 5/10 is 1/2 is 3/6, so 3/6 and 1/6 is 4/6! If they had used the fraction wall they would have been able to 'see' this but they were so indoctrinated to change the denominator that they could not get past this road block. Their method is fine, but our method is just as valid for the problem given.